Welcome to the July 2016 edition of the newsletter. The new financial year has coincided with the steady rollout of the National Disability Insurance Scheme (NDIS), which will in this year alone take on as many new participants as it has in the past 2.5 years. The scale of the rollout is taking its toll, with the provider portal down for some time in July, resulting in non-payments for services across the country. A number of MOD.A members are directly affected by these problems and we would be happy to relay concerns members may have directly to the National Disability Insurance Agency (NDIA). We still do not have any clear or consistent policy advice from the NDIA about how home modifications will be administered nationally, and have yet to be invited to participate in the deliberations around that policy. This is disappointing, and contrasts with the dialogue that we have with the Department of Health about the ongoing problems providers and clients experience with My Aged Care (MAC). Many problems with MAC and CHSP, and now DEX, have been reported by members, and we will continue to work hard to have them addressed and resolved. We have carefully considered the responses of members to our Member Feedback Survey distributed in May. Many thanks to those who responded and provided us with such useful information about what you believe MOD.A is doing well now, where we need to improve, and what our priorities should be in the future. We have begun planning for a series of information/training events across the country, commencing in the latter half of 2016 and continuing throughout next year. We have also identified August 2017 and Sydney as the preferred location for our next annual conference. Details regarding dates and venue will be finalised in the next few weeks. Our focus on events and education has caused us to rethink our human resource needs, and we have sadly had to let go our Policy and Projects Officer Reena Masrani. Reena joined MOD.A in January 2015 and has worked with many members on our various policy responses and submissions, and on the research we have done into client information. We are very sad to see Reena go and wish her all the very best for the future. Reena has asked me to thank those people who have assisted her with surveys and other information, and assisting her to understand the issues faced by providers when attempting to implement the new reforms. Finally, I am pleased to announce a new member benefit which MOD.A has negotiated with HR Assured. Details of the benefits are included within this newsletter. Members are encouraged to look at what is being offered and how this may be of benefit to their service. We also hope that members take the opportunity to directly contact us about other benefits they believe MOD.A can negotiate for the sector. MOD.A CEO Michael Bleasdale attended the National Press Club of Australia's Aged Care Forum on 13 July 2016. Attended by a range of national aged care providers, peak bodies, unions, professional and consumer groups, as well as many of the senior officials of the Department of Health responsible for Aged Care, the forum provide an opportunity for three prominent leaders in the sector (Paul Sadler, Lee Thomas and Ian Yates) to promote the work they do through the National Aged Care Alliance (NACA) to develop and implement the Aged Care Road Map, and to argue against some cost-cutting measures in the recent federal budget. Home modifications is an important inclusion in the Road Map, and MOD.A continues to work with NACA to ensure that the home environment remains a significant focus of the policy makers as the reforms in aged care continue to evolve. The proceedings of the National Press Club forum can be viewed here. Members will be aware of communications coming regularly from the office of the Aged Care Complaints Commissioner. This office was separated from the service delivery arm of government in late 2015 and is increasing its profile to ensure that clients and providers are aware of the services it offers. The approach taken by the Commissioner is about local resolution of complaints. All services need to have a complaints handling process which is made clear to their clients, and the acceptance and resolution of complaints should be very much a part of everyday practice within modern service organisations. Complaints procedures should include information about external bodies and organisations will need to note the new arrangements and contact details of the Aged Care Complaints Commission in their policies and procedures. MOD.A has been in contact with the office and can confirm that complaints regarding home modifications do fall within its jurisdiction. We are now looking for a time to meet to discuss how complex complaints (that possibly include building and/or allied health issues) can be coordinated across a range of complaints handling mechanisms. Sussan Ley has been reappointed as Minister for Aged Care and Minister for Health and Ken Wyatt as Assistant Minister in the Cabinet reshuffle after the election. Aged care stakeholders have welcomed the continuity during the next stage of aged care reforms but have indicated more engagement and cooperation with the sector is needed, particularly around the contentious issue of aged care funding in general and the Aged Care Funding Instrument in particular. Despite calls from NACA and individual members of the sector the government has still not released modelling that underpinned changes to the ACFI and the $1.8 billion in funding cuts announced in the budget. The only change to the aged care and health portfolios announced by the Prime Minister was Dr David Gillespie replacing Fiona Nash as Assistant Minister for Rural Health. In the Shadow Ministry Shayne Neumann has moved from the Ageing portfolio to Immigration and Border Protection. Shayne has been replaced by the Hon. Julie Collins who ads Shadow Minister for Ageing to her Mental Health portfolio. Senator Helen Polley is the Shadow Assistant Minister for Ageing. Senator Doug Cameron has been named the Shadow Minister for Housing and Homelessness. Providers are strongly encouraged to complete data ahead of the end of the reporting period at midnight (AEST) this coming Saturday 30 July 2016. Input should reflect services delivered between 1 January and 30 June 2016 and is a contractual obligation in the grant agreements of all organisations reporting through the Data Exchange. There will be no general extensions to the due date for this reporting period. Please refer to the Data Exchange website, should you require information regarding extension requests for exceptional circumstances. The NSW Government has yet to announce its decision on how it will reform the HBCF but we have been advised information on how the government will proceed will be available in coming months. MOD.A made its submission to NSW Fair Trading on the Reform of the Home Building Compensation Fund Discussion Paper (December 2015) back in February after consultation with members and is available on our website. Other submissions received by NSW Fair Trading in response to the Discussion Paper are available here. The new Slip Resistance of Ramp Materials - Examples list has now been published on the HMInfo website, along with a second edition of the Industry Factsheet: Slip Resistance of Ramps. The new Slip Resistance of Ramp Materials - Examples list only includes material examples that have an AS 4586 test report available from the supplier and that have been verified. To be a deemed-to-satisfy solution for a slip resistant ramp in NCC 2016 the material needs to achieve the appropriate slip resistance classification when tested in accordance with AS 4586 by a NATA accredited testing organisation (some materials have a slip resistance classification resulting from testing to other Standards or testing by organisations that are not NATA accredited). Additional information is available from the HMInfo website. As notified by email on 20 July, there are currently two opportunities for MOD.A to provide input to national policy. The Department of Health is conducting a forum on 2 August about long term case management in aged care. Home Modifications Australia has been invited to participate at the meeting in Canberra to provide information about how long term case management has worked and impacted on the sector in the past, and what the experience is now, since it was removed in large part from the HACC programme and CHSP. What also needs to be considered in addressing any potential service gaps in the short term and also in the longer term in context of the reform of the national aged care system. As MOD.A will represent the experience and views of the home modification industry at this forum please contact me by email with any feedback you may have on these four broad issues by COB Monday 1 August. Thank you to all members that provided comments and other feedback for our submission to this Inquiry. We are currently finalising our submission and will make available on our website shortly. The National LGBTI Health Alliance Silver Rainbow project has just released two new Factsheets available from their website. MOD.A has partnered with HR Assured to provide members with a complete workplace relations solution specifically designed for small business. There is no question that government red tape around employment standards and people management has reached an all-time high in Australia. The introduction of the Fair Work Act in 2009 and National Employment Standards in 2010 have put much of the burden onto employers in terms of providing a safe and equitable environment for workers. The risk of getting it wrong can be costly in terms of lost productivity, reputational damage and legal expenditure. Having a thorough framework in place is essential to ensure compliance with government requirements. providing businesses with comprehensive coverage against costs and compensation associated with workplace-related claims. Audit: HR Assured begins with front-end compliance, so every business that comes on board goes through a comprehensive audit. The reasoning behind this is very straightforward: compliant businesses have reduced exposure to legal claims and enhanced workforce engagement, both of which promote better business performance. This leads to a number of recommendations to deliver best-practice people management. HRA Cloud: HRA Cloud is the first step in the implementation of this complete people management system. As an online information and management system, HRA Cloud provides businesses with human resources and workplace relations support wherever and whenever they need it. The cloud-based platform provides industry-specific information; contract, policy and other document creation capability; as well as people and safety management workflows. In short, it is a dynamic, rather than a static, people management resource that is constantly updated so that businesses can be sure they are compliant at all times. Telephone Advisory Service (TAS): HR Assured clients can call the HR Assured TAS at any time on any day and run through any employment-related issues. The consultants can log into the client's HRA Cloud account and take them through the documents and processes step by step. The TAS consultants will give the client detailed advice designed to achieve an outcome, not just answer a question and then leave them to work out how to implement the solution. Insurance and Representation: If an HR Assured client has accessed HRA Cloud and the TAS and they receive a claim from a current or former employee (for example, an unfair dismissal claim), they will be represented by FCB Workplace Law and are insured against all claims and awards up to $2 million, with no excess. All MOD.A members can benefit from the partnership with HR Assured. We are pleased to advise that following on from the success of our National Conference in April 2016 we have identified August 2017 as the date for the next MOD.A National Conference. At this stage we are still negotiating with venues but can confirm that it will be held in Sydney. More details will be available in next month's newsletter. Regular readers will be aware that MOD.A were contracted by the NDIA to develop and deliver an OT Training Program for the NDIS. In collaboration with LifeTec we developed two training packages covering Basic and Complex modifications. 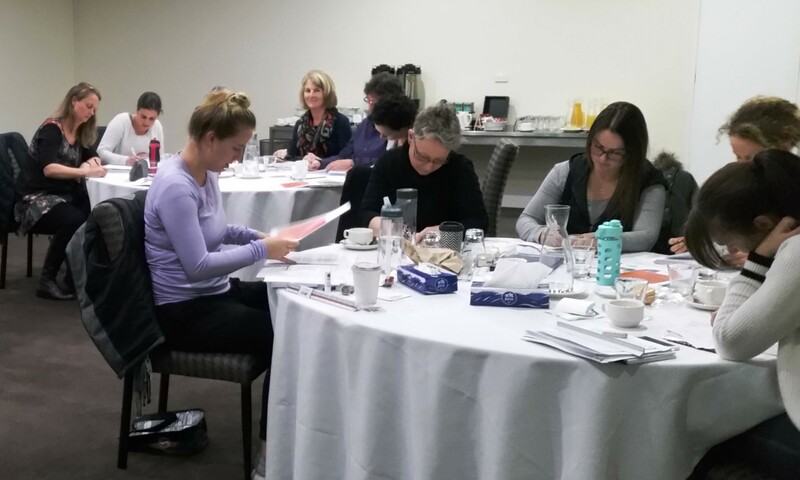 On 18-19 July we delivered the latest iteration of the 2-day Complex Modification course in Hobart to OTs interested in assessing and prescribing complex home modifications for clients under the NDIS. Our training allows for extensive interactive participation and is based on adult learning principles. The focus is the specific requirements of the NDIS in prescribing complex home modifications with detailed case studies to illustrate the what and why of reasonable and necessary under the Scheme. At this stage we do not know what other training opportunities will be made available to OTs as the NDIS continues its progressive roll-out. Feedback from participants has been extremely positive and ad-hoc evidence suggests an improvement in the quality of prescriptions from those that have attended. If you are a private OT or a home modification provider interested in accessing this training contact your local NDIS office to request delivery in an area near you. Active Ageing Conference 2016: Wellness, reablement and restorative care in aged care. Swissotel, Sydney, 4 August 2016. Griffith University NDIS Symposia Series. Housing for people with disability: What does an inclusive housing system look like? Brisbane Convention and Exhibition Centre, South Brisbane, 8 August 2016. OTNSW Workshop: Environmental Home Modifications - The Basics, Taree, 12-13 August 2016. Universal Design Conference, Sydney Town Hall, 30 -31 August 2016. ACSA 2016 National Summit. Hotel Grand Chancellor, Hobart, 6-9 September 2016. Dementia Forum: Stories of Me. Sydney, 15 September. Home Modification Forum - OTs and Project Managers Working Together. Parkville, Victoria, 15 September. Occupational therapists working in the field of home modification in Victoria are invited to this Home Modification Forum which explores the opportunities and challenges for occupational therapists and project managers working together to provide home modification services in the new insurance environment. Organised by Architecture & Access, MOD.A member. MOD.A National Conference. August 2017. 6th International Conference for Universal Design. Nagoya, Japan. 9-11 December 2016. Disability and a Good Life: Working with Disability (commences1st August). For further information contact Leanne Dowse or see more here.